Why does two charts of the same timeframe look different on the same platform? I use Zerodha Pi. I have seen this happen a few times, I am looking at a live chart, say 1 min Nifty dec future chart. I open another chart from the marketwatch for the same 1 min timeframe of Nifty dec future, both the charts don’t seem to match exactly. There is usually a small difference, why is this? Why does the same technical charts for the same stock from NSE Tame, Google finance, Yahoo finance, Amibroker, not match? Why is OHLC data different on live charts and marketwatch? Why do pivot points differ on Kite and Pi? How is this calculated? When you open a chart during market hours, the live candles are formed by using data received on your platform. If for a second there was an internet drop (which is quite common in India) the data for this second doesn't get received on the live chart that you have opened. When you open the chart during market, the historical candles are formed by using data on our data server. Our data servers are within a data center where our streaming server is also present. This ensures that there is no internet drops that happen between the streaming and the data server. So let me give this example, you have 1 min chart open for Nifty future from 9.15am in the morning. By 9.30am, you will have 15 one min candles that would have been plotted using the data received on your Pi platform. If in these 15 mins, your internet was down/fluctuating, data for those few seconds would not have been received, but candles would still have been formed. At 9.30 am, you open another chart of 1 min Nifty future. You see that this chart is not exactly same to the chart that was already open from 9.15 am ,u see a difference in candles. So you question why? My guess is that the answer should be quite obvious by now. This happens because the chart you open at 9.30am pulls data from our historical data server which would have no missing data. The candles are formed using this data, and hence the candles might be different from what was seen on the other chart. The more intermittent your internet connection, more the mismatch will be. The chart that you pull from our data server will always be the one more accurate. This issue will be with any charting platform that you use. Many charting platforms to remove this confusion restrict you from opening more than one chart for the same timeframe/scrip. A chart is formed from various price points plotted on a graph. When a chart is open, these price points are derived from the live server, i.e from the market watch ticks. Whatever ticks are coming on the marketwatch those prices are considered for formation of the chart. But when you open a chart midway the chart gets plotted from the data points that is already stored on the data server. Since there’s a difference between the broadcast of the live ticks and the number of stored ticks per second, there may be a slight difference in the way the chart appears. For eg: The number of price points used to plot the graph while viewing it live maybe 4-5 but when you open a new chart, it may form from price points from the data server which may have recorded only 1 tick. the major problem not solved. in pi chart it is buy and in kite it is sell signal even after the chart opened next day. this is not a problem of live data feed. major technical issue to be solved by kite/pi chart developer. as per price pi chart is correct. ALBK EQ NSE Chart 15 June 2018. 2nd candle onwards many candles don’t match in MT4 and Zerodha. Any reason for this difference in charts even when High and Low data is same? I’m given this link for Zerodha Support on my ticket that I created today morning. July Crude futures data in market depth was incorrect while the chart data is correct. I saw this today morning outside of market hours. Day high was different by 35+ points, this is not a small difference. This should not happen, I believe in this case market depth is not updated, chart takes live prices from same ticker, you faced this once or multiple times? Noticed only yesterday. It was reported to me by someone else. This can’t happen, most likely your market watch window stopped updating may be due to connection issue. No sir. If you notice the time in screenshot, it was around 7AM yesterday. I have FTTH and no connectivity issue for me. Like I said, I didn’t notice this issue. Someone else highlighted it and I wanted to check myself. 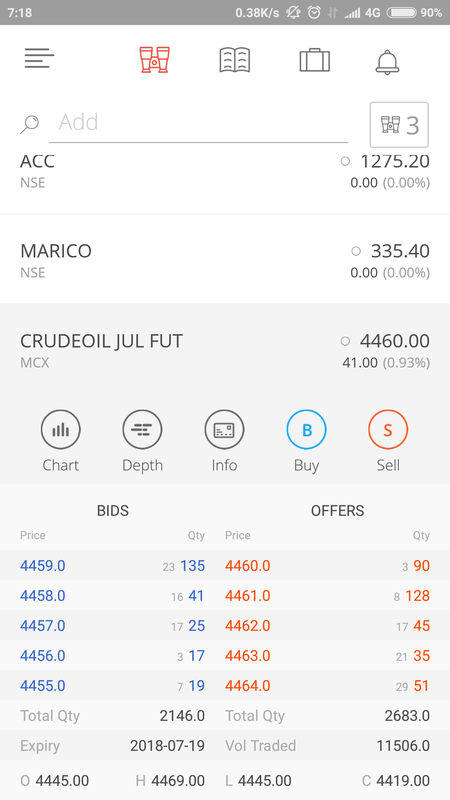 I found the same and raised a ticket at support.zerodha.com (Crude Jul Future [Ticket #20180621950512]). It could be an one-off, but I wanted the technical team to find the root cause and address it so it doesn’t reoccur. Most, including me, rely on market depth. Incorrect data there is not good. I believe the chart data is of around 7pm, also nothing as such was reported earlier. That’s a huge issue in the chart, difference of 35+ points are terrible for traders! Many a times chart gives problems now days. Every 30 minutes i have to log out and log in again. Charts HANG in between. I have to keep on checking Indiabulls and MT4 account . Zerodha getting slower and slower. Pi software dont run at all on SONy laptop with 6 GB ram and win10. Can you write to me at tsiva@ zerodha.com, will get this checked. i see that opening price of a stock at 9:15 is different in different time frames. why so? Populated candle shows OHLC data in pi, same candles when refreshed shows different OHLC data, Zerodha customer care blames my internet connectivity, but my internet connection is good. Can this be fixed @nithin ? I have explained on my first response to the main question on why it isn’t possible. 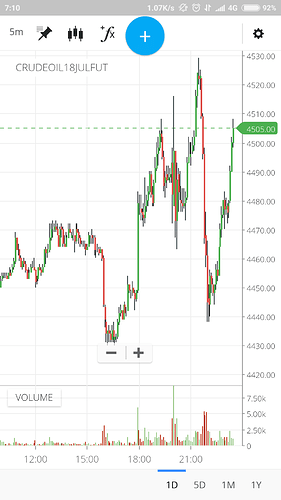 Dear @nithin, I would like to draw your kind attention towards wrong candlesticks formation during market and after market hours. Like today on 25th September 2018, BOSCH 1 DAY candle was showing Open price at 19578. Whereas on left hand side it was coming something near to 19520. After market hours are over, candle shape changes. Its now MARUBOZU in green. Its technical glitch everyday or some technique to lure clients. Because during market hours the colour from green to red was changing at 19577. And after market hours 19577 is still green. Shall we shift to MT4 feeds ?